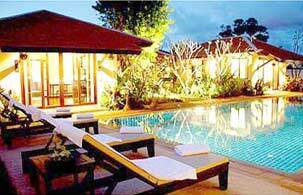 Anchan Resort is a boutique hotel. We offer elegance, luxurious, personalized service and intimacy.It’s a peaceful oasis, offering easy access to the activities of Phuket and surrounding islands.With six one-bedroom villas and a luxury suite with jacuzzi and private garden. There is an on-site spa, established to the highest international standards, a restaurant offering gourmet Thai and international cuisine, and access to a private beach. Anchan Resort uses a holistic approach to physical and spiritual well-being, where we listen to your body's needs and you can relax, enjoy, revitalize and rejuvenate. Come and treat yourself to a choice of massages, facial treatments and body wraps in our peaceful oasis. Enjoy jacuzzi, steam room and a complimentary swim in our pool. The Spa Offers traditional Thai Massage along with other invigorating massages and body treatments.